The Perch Creek Family Jugband are proud to announce the release of their brand new album ‘Tall Tales’! Recorded with state of the art digital recording gear in a not-so-state-of-the-art mouldy little shack way up the forgotten end of the Doon Doon valley during a rainy April in 2011, the new album showcases the band at their finest and most eclectic. This, their second album with the current line-up, shows the band exploring new directions in songwriting while still staying true to their jug band roots. The recording features strong original material and powerful five part vocal harmonies unifying an album that travels seamlessly between genres as diverse as bluegrass, blues, old-time jazz and even a touch of soul. For those of you unfamiliar with the PCFJB, imagine five young folks who all look eerily similar to each other singing and playing their hearts out on banjo, honky-tonk piano, jug, saw, trombone washboard, and harmonica. From humble beginnings in a rat-infested shack in sub-tropical NSW, the album has taken a long journey down to the big smoke of Melbourne, Australia to be professionally mixed, mastered and what’s known in the industry as ‘rolled in sparkles’. The result: why don’t you take a listen for yourself? 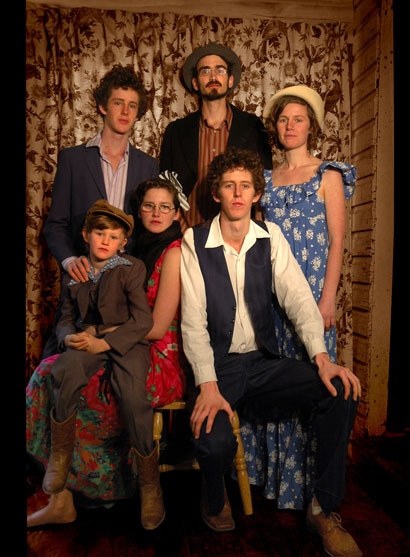 The Perch Creek Family Jugband takes us back to a simpler time with their latest album Tall Tales.